Thankyou the flowers look lovely. Great gift ideas for Dad delivered in Auckland. Fathers Day Gift Baskets, plants, masculine floral designs, to fathers day balloons. Please note: Due to couriers schedules, Fathers Day deliveries will be made Saturday 31 August. Dads love gift baskets and they are very popular! From the "Man Box", to gourmet gift baskets, fruit baskets, cappucino coffee gift boxes, the sweet tooth hamper, or even a healthy treats hamper. We can deliver Gift baskets for men Auckland wide. Particularly for older Dads, a plant is a popular gift choice and great value too! 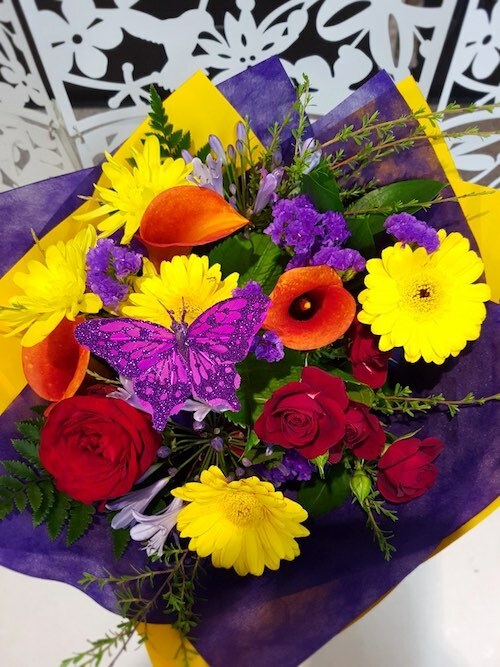 Anthuriums, and peace lilys, are lush green flowering plants, or a kalanchoe plant gift can all be delivered for Fathers Day.